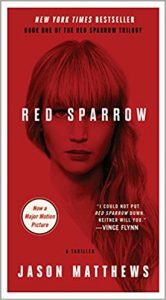 If you didn’t catch Red Sparrow when it first came out, there’s still time before the major motion picture is out of theatres and streaming on a device near you. And don’t just take my word for it. The fact that Hunger Games director Francis Lawrence and A-lister Jennifer Lawrence (no relation) poured their heart and soul into this novel penned by former CIA-operative Jason Matthews is recommendation enough. In contemporary Russia, state intelligence officer Dominika Egorova has been drafted to become a “Sparrow”—a spy trained in the art of seduction to siphon out information from their marks. She’s been assigned to Nathaniel Nash, a CIA officer who handles the organization’s most sensitive penetration of Russian intelligence. The two young intelligence officers, trained in their respective spy schools, collide in a charged atmosphere of tradecraft, deception and, inevitably, a forbidden spiral of carnal attraction that threatens their careers and the security of America’s valuable mole in Moscow.